If Florence can lease its piazzas, why can't museums lease antiquities to raise $ to protect sites? Florence is leasing the Palazzo Vecchio, the Ponte Vecchio, the Piazza d'Ognisannti, the Belvedere... the list goes on and on. A lot of desperately needed money is being raised, although the inconvenience to residents (and presumably, also to visitors barred from these public spaces for the duration of the lease) is real and not inconsequential, unless the lease is during hours when the building or bridge would not be in use or normally closed. The temporary privatizing of cultural space is not a new phenomenon. As I learned while researching the Brooklyn Museum controversy over the Chris Ofili Madonna (see my intro to the edited volume Unsettling 'Sensation' here), museums have been renting out their great halls for corporate and individual soirées -- not just gala fundraisers for the museum, but private functions -- for decades now. Which raises the question: If Florence can lease its piazzas and museums their exhibition spaces to raise money needed to preserve their heritage, why can't museums lease antiquities from their storerooms to raise money needed to preserve archaeological sites? Antiquities dealer, who also is a collector and a curator of his own online "museum", cops a plea. Note the "safe haven" self-justification. McNamara said he kept, rather than sold, most of the materials he imported from Pakistan, as his interest was mainly in the scientific value of the relics rather than the monetary value. He said he did not think initially that what he was doing was illegal and, in some ways, thought he was rescuing precious materials. But McNamara acknowledged that he realized that willful ignorance of the law was no excuse for his crime, and he did sell some of what he imported. He admitted that he and the others conspired to create fake documents indicating that their shipments had Pakistani government approval, and that he lied to U.S. Homeland Security investigators looking into the matter. The Green family has spent a reported $30 million amassing its collection, and have been under federal investigation for five years under suspicion of importing looted artifacts. One reason the investigation has gone so slowly, one must presume, is that the government doesn't have the resources to go faster. Now imagine that the US put in place a tax on purchases of antiquities, say 10%, on the principle established long ago by economist Arthur Pigoux that the social costs that are the byproduct of some economic activities (i.e., air pollution) should be paid back by the industries involved in creating the harm. Spending $30 million in the antiquities market, whether the purchases are legitimate or not, causes social harm because the licit market is not clearly distinguishable from the illicit market and because high prices signal to looters that antiquities are desirable commodities. the task force proposed by Italy, which “is gaining traction at UNESCO”, should include archeologists, military forces specialized in the safeguard of cultural heritage, ONGs personnel and cataloguers. “They should be deployed in “grey” areas where there are tensions, but not wars”. It is something similar to the “culture peacekeepers”, as it was discussed recently, but “definitely, we are not talking about sending paratroopers to Palmyra”, clarified the minister. Italy thinks that peacekeeping missions should also include a cultural dimension, and Gentiloni made the longstanding experience acquired by Carabinieri available to the project. In the appendix to Antiquities under Siege: Cultural Heritage Protection after the Iraq War (Altamira, 2008), we put forth this recommendation, among others. The key difference from other "Monuments Men"-style task forces being advocated for by Blue Shield and other preservation/conservation-focused groups is that here there will also be some people who can protect the sites from gun-toting looters, a crucial need if the work of preserving and conserving is to be feasible. An ethics of precarity is too close to taking art photographs of decay in a city we cannot save. Adam Smith, who was also interested in the naturalness of capitalism, once wrote that there is a lot of ruin in a country. The same goes for the world. It is too soon, and, more important, it surrenders too much, to make ruin our master-metaphor. The world still has a good deal of ruin in it, and, we can hope, plenty of fight as well. One of the lingering questions about the massive looting that occurred in Iraq in the years following the 2003 US invasion is where all the artifacts have gone and why it continued even after a worldwide ban on international trade in Iraqi materials was put in place, abating somewhat over time. Very little appeared on the open market and it is thought that much was simply stockpiled in warehouses, or bought privately by wealthy collectors around the world. started an initiative to make deals with smugglers after the U.S.-led invasion of Iraq and the subsequent looting of museums in the country, according to Ancient History Etc., a U.K. nonprofit online publication. The museum bought a tablet -- one of a group of 80-90 being proffered -- containing 20 previously lost lines of "The Epic of Gilgamesh, for $800 off a smuggler in Iraq in 2011. "They paid smugglers to ‘intercept’ archeological artifacts on their journey to other countries," according to the publication. "No questions were asked about who was selling the piece or where it came from." Stuart Gibson, director of the UNESCO Sulaymaniyah Museum Project -- an effort to assist the Kurdish government in running the museum -- praised the museum's decision as "courageous" because it ran counter to official policy against paying smugglers and looters for looted artifacts. That policy exists, of course, because paying these folks gives them an incentive to keep on looting and smuggling. Asking no questions makes this incentive even more attractive. The Huffington Post headline suggests that the question raised by the museum's practice of buying looted antiquities is : Should museums make deals with smugglers and looters in order to protect and preserve history? But that way of putting the question, while it is undoubtedly the way that museums interested in bringing material in think of what they are doing, begs the question. The deal described was not made in order to protect and preserve history. It was made in order to keep the artifact from leaving the country. Had the tablet gotten out of Kurdistan it would surely have been sold to someone anyway, someone who would have in turn protected and preserved it. The only effect here was to shorten the supply chain, reduce the cost of doing business for smugglers and looters, and thereby promoted more digging and more smuggling. This is not the only Palmyran sculpture on display in this part of the world. Other first-rate examples can be seen both at the MFA and in museums such as the recently renovated Wadsworth Atheneum in Hartford. But with its fine carving articulating the woman’s “wet drapery” garment and exquisitely pleated headwear, her perfectly parted wavy hair, and her Hellenistic features, it’s both beautiful and characteristic, and it hasn’t been on display in a generation. "Quite possibly one of the most important developments in the field of cultural heritage policy in recent years. Not only does the AAMD declare its support for the 1954 Hague Convention, but it will treat objects in AAMD member museum safe havens as loans--not permanent acquisitions. (As such, a U.S. museum would need to follow U.S. law for an international museum loan to participate). The guidance outlined here is what framers of the 1954 Hague Convention had in mind for museums following World War II." I cannot share this enthusiasm. Framers of the 1954 Hague Convention did not have in mind, objects dug up from archaeological sites by private parties, smuggled out of Syria to Turkey or Dubai and then bought up by dealers or collectors. There was nothing like the global market for illicitly excavated antiquities in 1954 that there is now. And the AAMD protocols, I worry, include provisions that will encourage more looting and smuggling of artifacts. The garbled syntax in the first italicized phrase is a tell, indicating that this is an issue the AAMD must have been wrangling. With good reason. The last quoted paragraph above notwithstanding, the protocols give a green light to museums to accept as loans artifacts purchased from the networks that are paying looters to continue to dig, networks that in some cases are run by or beholden to ISIS. Those who purchase such blood antiquities will now be able to loan them to a museum, which will provide the buyers with a patina of legitimacy and museum approval that will increase the value of the artifact when it is returned to them. Taking as loans artifacts from museums, government entities, or seizures is an excellent idea. Taking as loans artifacts bought from the illicit market is a terrible idea. Those who have been applauding ICE's ceremonies returning seized artifacts should instead be booing. They don't understand that every such public relations event that doesn't also include announcements of arrests and indictments is a lost opportunity and a symptom that the Obama administration has failed to devote the resources needed to really tackle the black market in antiquities. This is made clear in a very informative blogpost from cultural heritage lawyer Rick St.-Hilaire laying out in very damning detail the failure of the Obama administration's Justice Department to follow through on an antiquities smuggling case in 2011 that involved suspected money laundering tied to terrorism. Instead, the artifacts were returned in a DC photo-op ceremony. A specially assigned heritage trafficking prosecutor based at the Department of Justice in Washington probably could have facilitated this search warrant request by coordinating with the appropriate right U.S. Attorney's office. But no such specialist prosecutor exists. Maybe I just missed it -- and if so, will one of the readers of this blog please ease my mind -- but I don't recall hearing from ICE or the Department of Justice during last week's various policy events. The announcement of a reward for information leading to the disruption of terrorist-related antiquities-smuggling networks might indicate some movement in the direction of a heritage trafficking prosecution. But a dedicated prosecutor is long overdue. The Department of Homeland Security's budget is only $55 billion though, so perhaps they cannot afford one. According to Kim, Christie’s has a policy of not accepting items for sale without a legitimate signed title confirmation. In addition, they require provenance pre-dating the year 2000 as well as pre-dating any periods of significant conflict. In the three first cases, Christie’s ‘due diligence’ seems to have stopped short of tracing the collecting history back one step further, which would have opened the window on the Becchina transactions. In the fourth case (lot 93), Christie’s record lists the 1986 and 1997 transaction dates in the lekythos’ collecting history, but completely avoids mentioning the authorities’ raid of Horiuchi’s warehouse in Switzerland or the subsequent passage or ownership of the vase by the convicted Aboutaam brothers, through their ‘Phoenix Ancient Art’ gallery in New York and Geneva. If the art market cannot hold itself to task on objects where there is a known and extensive photographic record of illicit activity how will the art market perform its due diligence on antiquities coming from conflict countries like Syria, Iraq and Yemen where no confiscated smuggler dossiers exist? Video of the fascinating Asia Society/Antiquities Coalition meeting here. I came away from it hopeful that we are beginning to get somewhere, in several senses. First, Kevin Rudd's involvement as the director of the Asia Society's new policy shop gives us a former Prime Minister of Australia with the political leadership chops to help persuade both governments and powerful private parties to focus on the problem in a strategic way. Second, the stated willingness of a media campaign specialist to raise awareness in the corporate sector holds out the hope that, together with Rudd and of course the Antiquities Coalition, something like the Clinton Global Initiative's ivory project but for antiquities might actually be possible. Third, the meeting showed that there are a number of policy ideas cooking, some of them (like the antiquities-leasing scheme I push, or Cuno's retro notion of a return to partake, or the boots-on-the-ground called for by several speakers) more dramatic and unrealizable in the short term than others, but the key thing is to have this kind of discussion happening. Viewers can draw their own conclusions about the exchanges between Jim Cuno and Matthew Bogdanov, Katharyn Hanson, and me over Cuno's worry that the problem is overblown and his suggestion near the end of the program -- in response to my earlier modest proposal that the Getty and other museums could dramatically shrink the market for looted antiquities by renting out some of the artifacts sitting in their store-rooms -- that doing so would be a step backward. This new CBS report joins other undercover reporting that includes cellphone photos sent by traffickers to the reporter showing artifacts for sale. Which suggests an interesting idea I haven't heard mentioned yet for how to fight the illicit trade in such artifacts: gather such images, just as the CBS team did, and then post them on the internet, identifying them as illicit and effectively rendering the artifacts unsaleable -- at least unsaleable to what Matthew Bogdanos in the report names as "the four destination points of New York, London, Paris and Tokyo" (Bogdanos for reasons I don't understand leaves out the Gulf States, certainly a more likely destination for ISIS-looted artifacts than Tokyo). This would be a great program for UNESCO in coordination with INTERPOL, the FBI, the Blue Shield, and the carabinieri to undertake. [For reasons I hope are evident, it would not be something to be done by academics as part of a research project.] It might be sponsored by the Getty and dealers who ought to prefer this kind of exposure to the gotcha they've experienced from the use of the Medici archive to embarrass them. Maybe, instead of yet another meeting bewailing the loss of heritage, it would make sense to spend that money on some undercover work. After the publication of photographs of the royal graves at Copan in Honduras (Stuart, 1997), the site was looted (Agurcia Fasquelle, 1998) in a way that indicated collectors had effectively used National Geographic as a sales catalogue. Likewise, a hieroglyphic text and carving of a bound captive were extracted from one 1,300-year-old stela, and a single sceptre was extracted from another such stela, at Dos Pilas (Luke, 2005). Without perpetrators’ use of publicly accessible documents to identify the targets, the fact that these thefts were commissioned would have remained unknown. So at least in some cases, the existence of publicly accessible images did not deter buyers. But these were objects in situ not yet looted, and so not brought to the attention of law enforcement as pieces for which to be on the lookout. An interesting article from Khalid Hassan in Egypt Pulse shows that the economic crisis in Egypt, especially acute in the tourism sector, combined with the government's prioritizing of anti-terror (and, one should add, suppression of dissent), is leaving Egypt's site security in tatters, underfunded and outgunned by looting gangs. The security system within the Ministry of Antiquities is suffering major problems because of the security sector’s neglect in training the ministry’s security guards. The security forces in Egypt are generally unaware of the importance of Egypt’s cultural and civilizational heritage, because of the low level of education within the security institution. Meanwhile, only a limited budget is allocated to the guards in charge of the archaeological sites’ security, and there is not enough funding to train, educate and arm them. The Dahshur site includes the Red Pyramid, Egypt’s first fully constructed pyramid, and the Bent Pyramid. The site was added to UNESCO's World Heritage list in 2009. Yet looting there is organized and persistent. Wahiba Saleh, a senior inspector at the Dahshur site, told Al-Monitor that security staff there are only equipped with 9 mm pistols and often confront thugs carrying automatic rifles or machine guns. “The Dahshur site extends over 20 kilometers [12.5 miles] and there are only 10 guards to secure it, which means that each is required to guard 2 kilometers [1.2 miles]. How could it be possible?” she asked. Saleh said guards at the site are paid a monthly salary of no more than 400 Egyptian pounds ($52), while they are required to protect priceless antiquities. She demanded that the ministry raise their salaries, increase their number to no less than 40 people to secure the site, train them and arm them to confront saboteurs and outlaws. What is needed is clear: more money. How much more? For Dahshur, without a raise or upgrades to automatic weapons, the amount is $52 x 30 x12 = $18720 per year. Tack on, say, an AK-47 at $400 each (with a 4 year amortization= $100 per year per rifle x 40 = $4000) and $200 per year for training and educating per guard (=$8000), and you get something like $32,000 additional to protect that site. Double the salaries and the price jumps to about $50K. $50,000 is not that much money. But that's just one site. There are 12,000 or so site guards in Egypt. Let's assume we double their salaries and double the number, giving half of them automatic weapons. How much would the budget be? 24,000 x 52 x2 x 12 (= $29,952,000) + $400 x 12,000 (=$4,800,000) + $200 x 12,000(=$2.4 million). Total: about $37 million per year. If we quadruple the number of guards as suggested by the inspector quoted above, but for the whole country, the total would be $67 million per year, compared with $22 million now spent. That's real money. A rounding error in the US budget, a small but real cost in Egypt's $60 billion deficit-plagued budget. On the other hand, given the presumably devastating impact of bad publicity from looting (not to mention attacks on tourists), investing more in site guards -- and perhaps shifting some jobs to site guard positions within the 30,000-strong antiquities ministry (at least, that was the number mentioned under Hawass) might be worth it to bring the tourists back. But there really isn't any money for raising salaries or increasing numbers. As always, the key problem is FINANCING site protection (and other archaeological policing). Here's one idea for raising that $67 million: Egypt could start loaning out antiquities in exchange for a fee or contribution. To take the most crude example of how this might work, the antiquities ministry could select 6,700 antiquities from the millions now sitting in museum storerooms, antiquities that 6,700 collectors -- both institutional (for instance, a school district or corporation or mosque) and individual -- would be willing to borrow for a year at $10,000 per artifact. Obviously the design of such a program would have to be very carefully thought through, and there is a real question of whether there is enough demand from collectors who could meet the criteria for being eligible for such a loan. Estimating demand based on auction sales is next to useless, not only because so much of the market is private and illicit, but also because there are likely many many would-be collectors who avoid Egyptian antiquities for all the right reasons. Such a program would also entail some risk, even with responsible collectors, that the objects might be broken (though the loss this would entail might be mitigated if the objects were some of the untold thousands of near-identical duplicates held by museums. Archaeologists are likely to be adamantly opposed. Still, it is worth considering as one of the possible ways out of the disastrous financial difficulties Egypt's heritage protectors are suffering from and likely to continue suffering from for quite a long time to come. A very disappointing interview with Scott Simon in which James Cuno continues pushing the argument he made in the New York Times more recently to the effect that "portable works of art" from areas under threat by ISIS "should be distributed throughout the world" because "ISIS will destroy everything in its path." Simon obviously understood going into the interview that there was something very wrong with this argument, since in the middle of the interview he expresses puzzlement about how changing the law to keep artifacts brought to the States from going back to Syria and Iraq would do anything to stop something like the dynamiting of the Temple of Bel, at which point Cuno admits that "it's completely different" from portable antiquities. In other words, yes, I've been using a classic bait-and-switch tactic. Immoveable antiquities and portable antiquities are two different things. Simon should have stopped Cuno there and asked him why he was then using the destruction of one as a reason for protecting the other. The answer, though Cuno would not admit this, is to avoid dealing with the very uncomfortable truth that ISIS' view of how portable antiquities should be treated is close to his own. No state has ever been more willing to distribute its portable antiquities throughout the world than ISIS, which licenses digging and runs its own export operation. Sure, those digs destroy thousands of archaeological sites, but on the bright side, I'm sure there are many museum-worthy artifacts brought to light and distributed to the world in the process. I am of course not, repeat not, suggesting that Cuno supports ISIS. And in fact, Cuno in the interview immediately goes on to say "we can address [the trafficking of coins or small statues] by policing those borders to try to prevent or inhibit the illegal trade of objects across borders." So he clearly does recognize that distributing ISIS-dug artifacts is a bad thing. Dealing with the problem, on the other hand, is just not something he wants to think about. Let the Turks and the Lebanese tighten up their borders, no problem. (Who's going to pay for that to happen? Don't ask.) Meanwhile, whatever gets over those borders and makes its way to us we should be grabbing and keeping. It is surely a good thing for museums to assist each other in safeguarding antiquities they already hold and to make arrangements in advance to take or transfer holdings in worst-case scenarios. All museums, not just those in countries in crisis, also ought to be thinking of dividing and spreading out their own massive holdings to hedge the risks of attack by terrorists on a single building. An attack on the Getty or the Met is not unthinkable. But museums also should recognize that distribution of artifacts through the market, rather than from museum to museum, destroys many more artifacts than it safeguards. The irony here is that if Cuno turned his considerable intellect towards the problem of inhibiting the illegal trade in artifacts, he would find that distributing antiquities in the proper way could not just safeguard those antiquities by spreading them round, but could also inhibit the illegal trade. How? Museums should pull antiquities off their basement storeroom shelves and offer to allow collectors to borrow --not buy -- them in exchange for contributing to efforts to help police the borders and prevent the illicit trade. The thirst of collectors for beautiful artifacts could be slaked, ISIS would be robbed of the profits they are now making, and the presently-overmatched antiquities police would have resources to really go after the traffickers. If Cuno cares about inhibiting the illegal trade, this is a distributional solution he ought to be pushing. I'm sure it's because he hasn't thought this through yet, not because he wants collectors to bring him fresh artifacts more than he wants to keep ISIS from destroying sites and human beings. Are the laws protecting antiquities strong? What would real strength look like? The problem doesn’t lie with inadequate laws, but rather with compliance and enforcement. Certainly compliance and enforcement are problematic, but that is not in spite of the law being strong on paper but because the apparent strength of the law is belied by the small print in which its enforcement mechanisms are established and its purview defined. Of course, no enforcement mechanism save an invasion force could expect to deter a group that deliberately commits war crimes for TV cameras for the sake of showing contempt for the law. The idea of parachuting the carabinieri into Syria to secure sites against ISIS' iconoclasm is ludicrous, as is the notion that looting and trafficking of antiquities can be brought under control if only we have the will to enforce the laws we have now. Having the will and having the way are not the same thing. The 1970 UNESCO Convention has had very little effect in stemming archaeological looting even in states that are functioning and trying to fight the black market, because the Convention is badly designed as law and because protecting sites and policing a powerful black market is enormously expensive. Nonetheless, sites must be secured and the black market must be policed. To do that, three things are needed. First, better regulations (for instance, transparency requirements for antiquities sales) that make it easier to identify looting networks and for police to work together internationally. Second, changes in museum policies to take the steam out of the illicit antiquities market by setting up antiquities loan programs; instead of paying $100,000 for a looted artifact and incentivizing further looting, the same collector would pay, say, the British Museum $100,000 for the privilege of borrowing for a time an artifact from the storeroom. The revenue generated could be used in turn to help finance more and better policing (the potential of new technologies in this area is enormous). Much more revenue, however, could be generated by a third legal-regulatory change: a tax on high-end antiquities purchases. The key point here is that we need to think much more creatively not just about what we would do if only there were more money to do it, but about how to raise that money and how to make it less costly to do what needs to be done. Recipe for tasty antiquities trade: Mix together false provenance, customs misdeclarations. Store for several years. Serve to antiquities collectors. Discovered after sitting in a warehouse for two years. Country of origin misdeclared as Turkish rather than Libyan. Price misdeclared as $110,000 rather than $2 million. Inappropriate letter to a 14-year-old leads to smell of pot leads to spotting bags of pot in van leads to finding meth pipe in van leads to finding Native American artifacts. And yet the guy was smart enough to have tagged some of the cards with detailed info on findspot and stratum! The items included pieces of obsidian, a glass-like volcanic rock, shaped into points and clay pottery bowls. Some had index cards attached with detailed information on where they were found, when and even the depth of the soil from where they were retrieved, said public information officer Lt. Steve Brooks of Lake County Sheriff’s Office (LCSO). Dino Beltran, of the Koi Nation of Northern California, said thieves often take records of what they find to enhance the value of the artifacts. They do their research, looking through resource books and price guides to later sell the items online, at pawn shops or thrift stores. “There’s a large black market for these items,” he said. Originally, law enforcement officers had responded to a report of an inappropriate letter to a 14-year-old, allegedly written by Brian Gene Smith. The 41-year-old suspect was standing behind his white van with the double doors open behind a business in the 16000 block of Main Street in Lower Lake when the deputy contacted him just before noon. According to police reports, the deputy noticed that Smith was exhibiting the signs and symptoms of being under the influence. As he neared the van, the deputy smelled the scent of marijuana emitting from it and saw a bag with pot when he looked inside. Upon searching the van, he found drug paraphernalia in the form of a glass pipe stained with a white residue consistent with methamphetamine in the stem and a brown substance in the bowl, Brooks stated. The deputy continued to search the van when he discovered the Native American artifacts, Brooks said. He also found a flash drive which allegedly contained images of Smith holding a rifle and another unidentified man holding obsidian points. The US Bible Museum, about to open in Washington DC, has struck a deal with the Israel Antiquities Authority for a multi-year agreement to display artifacts, possibly even including artifacts that haven't yet been excavated by the Authority. Complete details haven't been released, but we do know that the deal includes both a permanent exhibition and rotating special exhibits. The IAA already has a long-term loan arrangement with the Met for about 30 objects, but the Bible Museum deal calls for hundreds or even thousands. In exchange, it would seem that the IAA gets, in addition to the opportunity to share some of its archaeological heritage with the world, Bible Museum sponsorship of a new archaeological dig. Readers of this blog likely already are aware of the problematic nature of the Bible Museum's interpretative focus and, more troubling still, of the likelihood, given the speed with which it has been built, that the museum's collection includes many artifacts of dubious provenance. But these ethical issues aside, this long-term loan agreement holds several important lessons for those interested in preventing the future looting of archaeological sites. First, there is a huge and growing demand for antiquities on the part of private museums being established at a record pace by wealthy collectors. This demand constitutes a huge opportunity to tap resources desperately needed by archaeological authorities in economically-stressed countries. Second, the way to tap those resources is via long-term loans that do not carry the stigma of selling off heritage. Third, the quid pro quo should recognize that securing archaeological sites from destruction is the highest priority. In this instance, that was not the case. Instead, the quid pro quo was (at least in part) investment in an archaeological dig. This is a good in itself, and will no doubt protect the one site being dug. But digs are not the most efficient way to protect sites from looters. Any deal should involving digs should also require the partnering museum/collector to give or do something to help protect sites or fight the illicit market. There are many possible forms that assistance could take, as readers of this blog know. The important thing is to establish the principle that caring for the world's heritage requires not just displaying it and digging it up but also protecting it in the ground. Fourth, any agreements should also include a codicil in which the museum partner agrees to follow strict rules going forward regarding acquisition of unprovenanced artifacts (including a pledge to require any artifacts proffered to the museum to be photographed, their owner identified, and the information shared with law enforcement). Museums will surely balk at this, but an attractive enough loan arrangement should assuage their anxiety. And since many collectors establishing private museums are currently fueling looting by buying unprovenanced materials, getting them out of the illicit antiquities market should do much to ruin that market. Technological innovation to detect illegal logging -- why not something similar for archaeological sites? A physicist, engineer, and inventor, has come up with an ingenious new method of detecting illegal logging activity in the Amazon in real time using old cell phones. There are obviously some differences between archaeological sites and trees that make it impractical to simply do the exact same thing: for one thing, chain saws are a lot louder. And in war-torn areas it might be impossible (ISIS will kill you if they find you carrying a GPS-equipped phone, for instance). But in general this is the sort of technological innovation that I have been argued for quite some time should be sought after in order to supplement/complement efforts to police archaeological sites. Establishing a prize for the development of some such monitoring technology would incentivize the search. There are plenty of possible funders of such a prize, ranging from wealthy collectors such as Shelby White, to dealers such as James Ede, to the owners of tourism agencies, to well-funded archaeological institutions such as the Institute for the Study of the Ancient World. UNSCR 2199 (2015): How Useful is it? 17. Reaffirms its decision in paragraph 7 of resolution 1483 (2003) and decides that all Member States shall take appropriate steps to prevent the trade in Iraqi and Syrian cultural property and other items of archaeological, historical, cultural, rare scientific, and religious importance illegally removed from Iraq since 6 August 1990 and from Syria since 15 March 2011, including by prohibiting cross-border trade in such items, thereby allowing for their eventual safe return to the Iraqi and Syrian people and calls upon the United Nations Educational, Scientific, and Cultural Organization, Interpol, and other international organizations, as appropriate, to assist in the implementation of this paragraph. In other words, nothing specific beyond what has already been affirmed. What the "appropriate steps" are is left to the imagination. Contrast the very specific steps described in the fifteen action items dealing with the oil trade, and the weakness of this resolution with regard to the trade in archaeological material becomes even clearer. 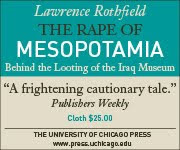 I wrote a book about the failures of policy that led to the looting of the Iraq Museum and of Iraq's archaeological sites following the invasion of Iraq. The advent of ISIL poses a much more difficult problem, to be sure, than the American invasion did. And UNESCO, Interpol and other international organizations are doing their best to respond to the call with the very limited means at their disposal. But the lack of more robust policy measures in UNSCR 2199 is a failure that needs to be studied and learned from. More evidence, as if it were needed, that ISIL is governing the industrialized looting of archaeological sites in its territory. It's the dealers' and collectors' dream come true: a government authorizing the excavation for export of antiquiities! Is this what John Merryman had in mind when he appealed for a licit international trade? By last summer, various "antiquities ministries" had been established across their strongholds. They have since been drawn together to form part of a "Ministry for Precious Resources", according to Aymenn Jawad Al-Tamimi, who has helped to gather an archive of Isil's operational documents. The Telegraph has obtained Isil-stamped licences, issued by the "antiquities ministries" in the Syrian cities of Aleppo and Deir Ezzor, giving permission to excavate archaeological materials, apparently in return for money. On WBEZ's Worldview, Mac Gibson and Patty Gerstenblith try to remain diplomatic, but make clear that the Obama administration is seriously delinquent in failing to have responded to the surge of antiquities looting in Syria and Iraq over the past years, in particular failing to issue an executive order banning imports of Syrian materials. One possible reason for turning a blind eye to looting before the rise of ISIS may be because the money made selling looted antiquities would have gone predominantly -- though we know not exclusively -- to anti-Assad rebel groups and suffering civilian populations. The administration may well have thought of the illicit antiquities trade as all in all a good thing in this situation, the loss of archaeological context and destruction of heritage a small price worth paying. In other words, the failure to ban imports might well indicate a covert policy of benign (sic) neglect. But it's been months and months since the first video of ISIL destroying artifacts made it impossible to ignore the connection between antiquities looting and support for an organization we are purportedly trying to destroy. Lawmakers are introducing legislation; the general in charge of the US's new air war over Iraq and Syria is questioned about what the US plans to do about ISIL's archaeological depredations. This week we learn that an ISIL leader killed by us turned out to have had a cache of looted antiquities in his house. Yet there is still not a peep out of the White House, notwithstanding John Kerry's big talk at the Metropolitan Museum last fall. So why the continued delay in imposing sanctions -- or in targeting bulldozers heading out to remote archaeological sites, or in putting pressure on transit countries to beef up border controls, or in supporting a bill to establish a coordinator capable of banging heads and getting the intelligence agencies to work together with the FBI to take down the smuggling networks supporting the trade that supports ISIL? Taking such a step would not only give Sotheby's, Christie's, and responsible dealers such as James Ede a p.r. boost that might well lead to a thaw in relations with hostile "source" countries and heritage protection advocates, it might also forestall what is surely coming down the pipes eventually: the imposition of regulations -- including transparency requirements and a tax -- on the market. I myself would much prefer to see the trade regulated de jure, but voluntary self-regulation of the kind I am suggesting is a not-unhelpful second-best solution. One of the few bright spots for the coalition was the successful raid last Saturday on the compound in eastern Syria where a top ISIL operative, Abu Sayyaf, was located. U.S. special operations troops killed Sayyaf, captured his wife and freed a slave the couple had been holding. Also seized at Sayyaf's compound, USA TODAY has learned, was a trove of antiquities, including ancient coins and a bible. ISIL fighters apparently had plundered the priceless relics during their sweep through Iraq and Syria that began last summer. It appears ISIL planned to sell them on the black market to fund its operations rather than destroy them, the first official said. It would be extremely helpful to know more about what specific antiquities were found, but this information alone should do much to allay the anxieties of those among us who have worried that exaggerated figures for how much ISIS is making from selling antiquities may destroy our credibility on Capitol Hill or with the Pentagon, making it difficult to get policymakers to take seriously calls to focus resources on protecting sites and on taking down the international antiquities smuggling networks. We don't need to get into the impossible-to-prove numbers game at all. It should be enough to simply point out that leaders of ISIS are themselves involved personally in the gathering and smuggling of illicit antiquities. That should be dispositive. If it isn't it at least will make clear that resistance to addressing the problem has nothing to do with the inability to provide reliable figures of the black market trade in antiquities. "Is it time to rethink our ideas about preserving world heritage?" The Financial Times asks the right question, and offers several useful answers. High-resolution recordings of soon-to-be-pulverized monuments may well be the best one can do in the absence of military action to secure sites or to deter movement of looters and iconoclasts onto sites. It should be clear, however, that what we lose when we are left with mere records rather than the things themselves is not just the materiality of the things but the knowledge that materiality may hold. A hi-res photograph captures only the visible and only certain aspects of the visible. It is much better than nothing but not a perfect substitute, regardless of whether one values authenticity. Craftspeople already know well how to make fakes that can fool even some experts -- one archaeologist has suggested that something like a quarter of the Meso-American artifacts in museums are probably fakes. But that's not a cheering thought. But even with such information, policing is going to be ineffective absent the funding resources needed to pay for site guards, customs officials, antiquities policing units, and local investigations to do the job of monitoring and going after the criminals. And despite professed new interest in cracking down noted in the article, it is very unlikely that governments in general are going to devote scarce resources to this problem. As the article also notes, the opposite is the case: heritage protection is being outsourced. And foundations and NGOs are unlikely to pick up the slack, especially given that policing, unlike restoration, is a permanent task. Some suggest that looters could be deterred by moral suasion from local religious or traditional authorities, and that undoubtedly must play a role; we know for instance that Muqtada al Sadr was able to turn looting on and off by issuing fatwas. But there are too many sites and not enough moral suasion for this to be the only solution. Another suggestion, being pursued with some success by the Sustainable Preservation Initiative, is that locals will guard their own stuff if they have an economic incentive for protecting it as a revenue-generating tourist attraction -- but while that may protect already-excavated individual sites it won't preclude those locals from going off to dig the unexcavated ones. What's needed is a sustainable revenue stream to pay for more and better policing of unexcavated sites. The funding solution, as I have suggested in the past, is to tax the higher-end licit antiquities market, with proceeds going into a fund for international heritage protection. Post-disaster response: Is priests spontaneously deciding to sleep in the ruins to stop temple looters the best we can do? To deter looters, Buddhist priests are now sleeping amidst the ruins of their temples. Something akin to this was done, if memory serves, to try protect Angkor Wat as well. This kind of mobilization of believers in heritage is deeply moving. It is also of importance that international agencies mobilize, as UNESCO is doing. But one big question that will have to be thought about after the fact is whether the UNESCO fact-finding mission structure is really the best way to deal with these kinds of disasters, or whether it makes more sense to invest the very scarce resources of UNESCO instead in disaster response plans so that even after a catastrophic event like this one there an in-country response team tied in to local volunteer groups is ready to get started assessing and mitigating, with call-back capacity to UNESCO and via UNESCO to the Smithsonian and other cultural heritage protection organizations. No such disaster plan appears to have been in place for Nepal. This despite 2 inscribed sites and 15 more on the tentative list of World Heritage Sites. If a reporter can go undercover and reveal a smuggling network, why aren't the police and UNESCO doing so? Much of interest in this story. If the Lagash relief is in fact genuine, and was dug around 2006 in southern Iraq, its appearance for sale on the Turkish border in 2015 reminds us that massive looting occurred between 2003 and 2008 during the US occupation. It also reminds us that dealers are willing to stockpile looted artifacts, especially valuable but "hot" ones, for very long periods until a buyer can be found. And it shows that the networks connecting smugglers with buyers are not independent chains but involve trading between middlemen -- a reasonable structure given the nature of the demand (one doesn't want to miss the chance to take advantage of the intermittent appearance of a possible high-end buyer). But the key take-home point is not made so much as illustrated by the reporter's having to go undercover in order to get the story, but being able to do so without much difficulty or worry. That shows that it is not hard to get to those dealing, but that the way to get to them is via locally-originated but sometimes multi-nationally pursued sting operations -- not, in other words, via high-profile but rare seizures by customs agents, nor the kind of arms-length work INTERPOL and UNESCO normally do. Antiquities smuggling networks are fluid, evolving, and adjustable, and this requires fluid and adjustable counter-operations. UNESCO does appear to be taking steps in the right direction, including establishing the "crack team" mentioned but not detailed in the article. Presumably it comes out of these meetings held last November and includes the carabinieri, who actually do the kind of work needed. But there have been no major take-downs of international networks since then, despite the ease with which the reporter was able to discover so much. Is the crack team involved in operations, or merely trainings? Several fascinating bits of information in this article. First, the itinerary of the object: from Nepal to the US and then to an end-buyer in China. an expert hired to investigate the ownership of the piece informed Homsi that it was “almost assuredly” the same Samvara statue stolen in 1983 from the Itum Bahal Temple in Kathmandu, Nepal, court papers say. Homsi then emailed another dealer about the statue on June 20, acknowledging that the piece had “the black spot of theft,” the court papers say. He added that he was “too nervous” to conduct a search through the Art Loss Register — a comprehensive database on stolen works — for fear he would be proven right, according to the court papers. Presumably the Chinese buyer didn't bother to consult the ALR either. Too bad it is not mandatory to consult the Art Loss Register and to post to it the object one plans to try to sell so that others might get a chance to look it over in case the ALR doesn't have it posted. But the dealers would have to decide that such requirements were in their best interest, or else the chances of them being put into law are zero. This upcoming meeting may well be the most important conference of the many being held these days on the looting of archaeological sites in the Middle East. One hopes that it includes some pointed discussion of the use of emirates as conduits and destination countries for smuggled artifacts. Kerry in Sept. 2014: "our heritage is literally in peril in this moment, and we believe it is imperative that we act now"
I want you to know that President Obama and our Administration are laser-focused on protecting the cultural heritage of countries all around the world. That is why we’re funding a landmark effort with the American Schools of Oriental Research to document the condition of cultural heritage sites in Syria. And we’re providing additional support to extend this effort into Iraq. We’re also doubling down on our support for Iraqi conservation experts and providing them with critical training on emergency documentation and disaster preparedness and response at the Iraqi Institute for the Conservation of Antiquities and Heritage. Through the National Science Foundation, we’re partnering with the American Association for the Advancement of Science on a project that uses geospatial technologies to track the destruction of the historical sites in Syria. They just released a big study that proves the destruction of these sites publicly. And this is yet another wakeup call, and those who deny the evidence or choose excuses over action are playing with fire as a consequence. Our heritage is literally in peril in this moment, and we believe it is imperative that we act now. Stirring words. But I noted at the time that Kerry's rhetoric was unaccompanied by any specifics about what action the administration would take, and I worried that it would be limited to the entirely necessary but utterly insufficient actions Kerry was touting -- documenting and monitoring the destruction -- when what was needed was action to stop the destruction likely to occur going forward. Documenting and monitoring won't do that; carefully designed military action arguably will, if only for major sites located in isolated areas. If it was imperative that we act now in September 2014, what about today?